In a dedication event held September 15, 2016, Waukee earned its designation as a Home Base Iowa (HBI) Community. Momentum for the HBI program continues to gain support from more and more communities. Both the Governor and Lt. Governor were on hand to recognize the new designation. Home Base Iowa is a non-profit, public-private partnership that aims to recruit transitioning and retiring service members to employment opportunities in Iowa. As these veterans seek civilian careers, HBI connects them to actively recruiting GI Bill apprenticeship programs and employers statewide. In addition to welcoming communities and excellent jobs, the program also includes veteran-focused educational institutions and opportunities for continued service along with countless resources for veterans and their families. 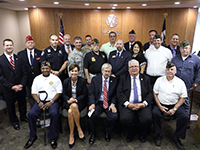 "The Waukee City Council Members and I saw a wonderful opportunity to draw hard-working veterans and military families to our community, and to give back to them as thanks for their incredible services," said Mayor Bill Peard. "This was a unanimous vote by the Council, and we are honored to be on board with Home Base Iowa." Home Base Iowa designates qualified communities as centers of opportunity for military veterans based on four standards; 10 percent of businesses within a designated community must become Home Base Iowa businesses, each community develops its own incentive package for veterans, the community prominently displays the Home Base Iowa Community designation and obtains a resolution of support from the appropriate local governing body. Visit the City's Home Base Iowa page to view a list of participating businesses as well as the City's incentives. See photos from the dedication event!